A film by Filipino director Joel Lamangan is set to be screened all over Australia. 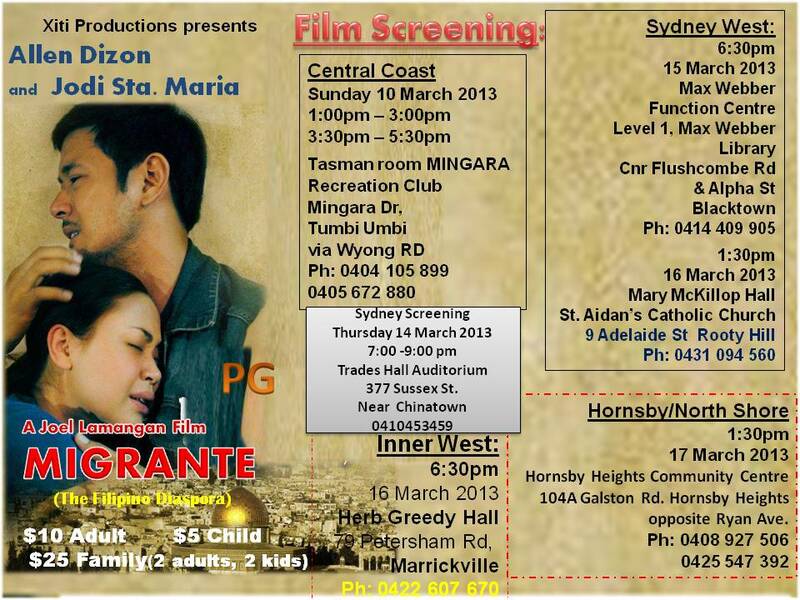 Migrante (The Filipino Diaspora) is a film that portrays the many faces of an overseas Filipino worker. The fates of the OFWs in the film were intertwined by the tragic incident that has befallen Frida (Jodi Sta. Maria) and her family. It also highlighted the role of people’s organisations such as Migrante International, which, in real life, have been at the forefront of helping fellow Filipino migrants workers in need. Lamangan teams up with Bonifacio Ilagan, a Palanca scriptwriter awardee, for this film which tells the sad tales of OFWs. He and Ilagan also worked in tandem, along with award-winning writer Ricky Lee for the Flor Contemplacion Story, a film about an OFW in Singapore who was given the death sentence for the murder of another OFW in Singapore Delia Maga. Ticket prices are: $10 for adults, $5 for kids, and $25 for family (2 adults and 2 kids). See poster for screening venues and schedules.